Between January 22nd and February 28th, you and your family and friends will want to head to downtown Vancouver to enjoy the LunarFest 2010. The festival promises to be a family (and stroller) friendly. The festival is part of the Olympics Cultural Olympiad and is a free event coinciding with the 2010 Vancouver Winter Olympics. Ten Canadian and Taiwanese contemporary artists will display a story wall projection and lantern forest comprised of ten large scale lanterns focused on the theme of Love, Life and Light. 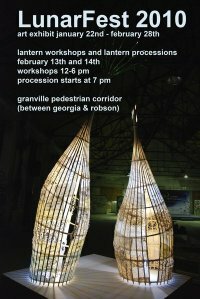 2010 lanterns decorated by children from Canada and Taiwan will illuminate Granville Street’s pedestrian corridor. The lanterns use LED bulbs and hang from 430 three metre tall steel trees. The theme of the lanterns is environmental protection and sustainability. There will also be lantern processions at 7 PM on February 13th and 14th featuring Korean drummers, Japanese taiko drummers, Vietnamese traditional bamboo music, a lion dance and a 10 drum Taiwanese group. Performers will lead a procession through the lantern forest, story wall and art exhibit from 4 PM onwards. On both days between 12 pm and 6 pm there will be lantern workshops for children. This event is co-sponsored by the Asian-Canadian Special Events Committee and the Public Dreams Society. 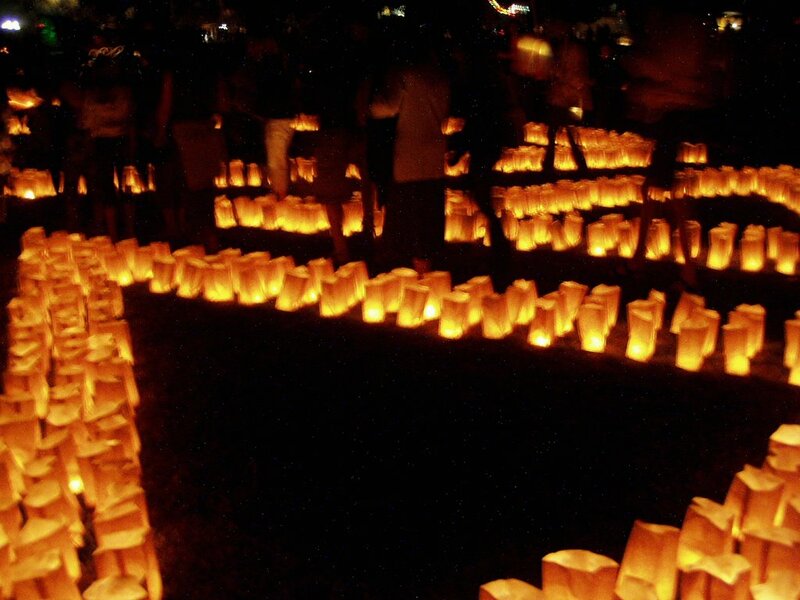 The latter has a long running tradition of creating art happenings and lantern events. When you attend the Public Dreams Society’s main yearly event – the Illuminares Lantern Procession – you can expect to see all manner of lanterns – a huge underwater garden with floating fish lanterns and giant octopus puppets that require nine performers each; a giant sculpture; singers performing from the branches of willow trees; a barn dance in an illuminated farmyard; fire shows; stilt-walkers; jugglers; musical troupes; massive, animated art installations; and, thousands of lanterns people made on their own, at home. The beauty of the summertime Illuminares Lantern Procession, Public Dreams Society’s ethereal midsummer art carnival, is its element of surprise—even to the people who organize it. To festival goers, a major part of the evening is watching the public’s homemade lantern creations float and bob around in the dark. 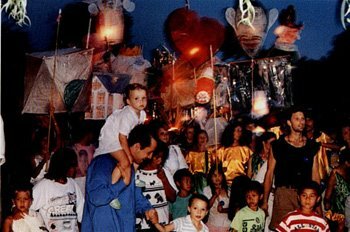 During the early years of the Public Dreams Society’s existence their main yearly events included the Parade of the Lost Souls, Take Back the Night (December 6th Vigil) and Illuminaires. One-off events included an open air play and events celebrating an opening such as the inauguration of the Canadian Craft Museum. Since the early days when events attracted a few hundred people, they now draw tens of thousands of people. The events are still very special and still community-based. For more information about the society see their Website. There are also links to partner events around Vancouver on this Website, such as the Salmon Festival (organized by Paula Jardine, one of the founding members of the Public Dreams Society). The following is BCfamily.ca’s example of simple homemade lanterns using glass rather than paper. Making a lantern is easier than you might think. 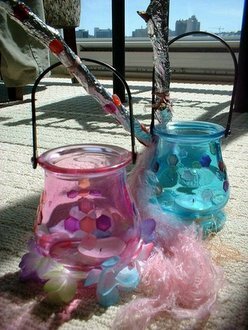 If you and your family do not have the opportunity to make a paper lantern, scout out your local dollar store, Winners or Home Sense where you are certain to find some kind of glass lantern like the one pictured above. Decorate the lantern with acrylic paint, stickers or faux stained glass stickers (as show in the photo above). Decorate the stick that will hold the lantern by adding ribbon, feather boas, or dried or silk flower, for example. Use votive candles inside. 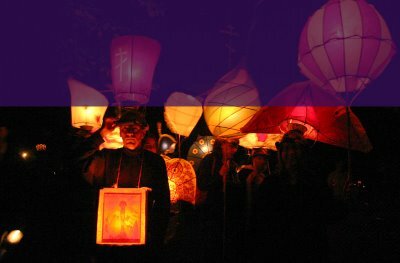 Making a lantern is that easy and you are certain to feel satisfied when you show up at the lantern procession with your own lantern in hand.